Our SPL TITANIUM rear camber links allow for an increased range of rear camber adjustment, necessary for lowered cars or for performance alignments. Our SPL TITANIUM series links are contructed with 1.25" 4130 chromoly tubing, slipped over a CNC machined angled steel sleeve then professionally tig welded. 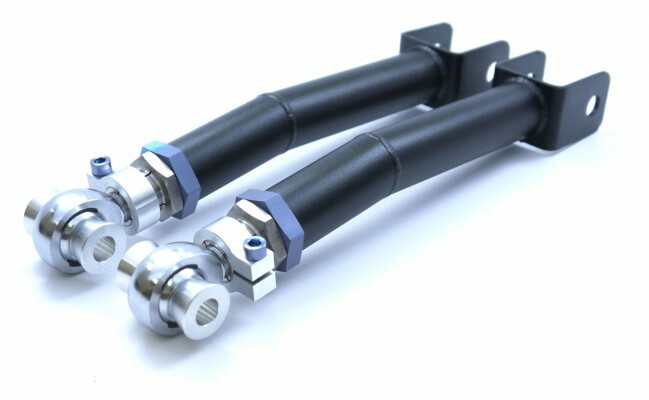 The angled sleeve prevents the links from hitting the sway bar under suspension travel, while allowing us to use hollow tubing to keep the link incredibly strong yet lightweight. Our exclusive 4130 chromoly hybrid adjuster offers quick and precise adjustment, and is CNC gundrilled to reduce weight. Blue anodized titanium hardware shaves even more unsprung weight from the arms, without compromising strength. USA made FK racing 3-piece bearing feature a teflon liner to provide quiet operation, lower friction, smoother articulation and eliminates bushing deflection under load. The liner is also self-lubricating and self-cleaning, offering robust reliability for street and track use. Pair with our SPL TITANIUM rear mid links or SPL TITANIUM toe links, and our SPL eccentric lockout kit for total rear camber and toe alignment with "zero-slip". Adjustment spec: Camber adjustment range is +/- 10deg from stock arm.